Successfully Added Homtom HT3 Android Smartphone - 5 Inch HD Display, Quad Core CPU, Dual SIM, Mali GPU, 3000mAh Battery (Gray) to your Shopping Cart. The H3 is the most affordable 5 inch Smartphone from Homtom and with a 5 inch HD screen, large 3000mAh battery and quad core CPU it packs all the important specs for a fraction of the price of most entry level phones. If affordability is a concern for your Smartphone purchase then the HT3 couldn't be a better match. despite its entry level price tag the HT3 comes with a smart and attractive design that features 2.5D glass, rounded edges and a comfy graspable rear surface so one handed use is a dream. The 5 inch high definition display packs in 1280 by 720 pixesl for a crisp sharp image that brings a high level of brightness and great color depth - enjoying movies and games is easy when he display is this good. Under the smooth outer is a quad core MTK CPU clocking in at 1.3Ghz and benefiting from a Mali 400GPU allows the HT3 to bring seamless performance with games, multitasking and surfing all at your fingertips. Running on the tried and tested Android 5.1 operating system ensures a solid performance that can handle all your daily phone needs without any lag or hiccups. while the HT3 comes with 8GB of memory you'll be pleased to learn that the micro SD card slot supports up to 64GB of storage so you needed skimp on extra apps, play lists, media or games as there's plenty of room for everything you need. 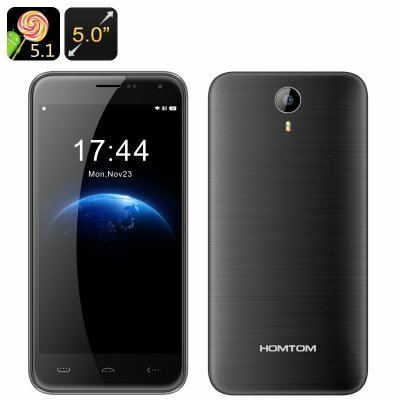 Dual SIM car slots brings the convenience of organizing personal and business contacts in to easily manageable lists so whether its work or pleasure the Homtom HT3 has it covered. With a 3000mAh battery you will get up to 200 hours in standby or around 12 hours of talk time from each charge. more than enough for even the most talkative phone users.